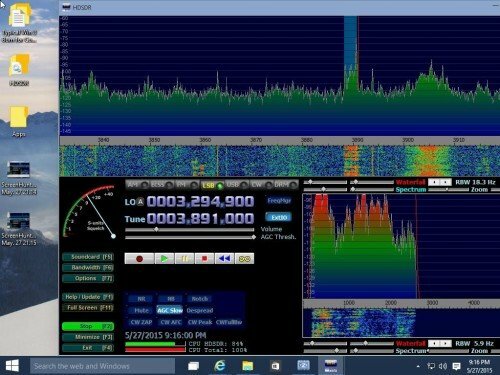 RTL-SDR.com reader Marty Wittrock has written in to let us know that he has been successful in getting his HF modified “KN0CK” RTL-SDRs (and by extension standard RTL-SDRs) to work with Zadig and HDSDR on a PC running the Windows 10 technical preview on a VMWare image. We decided to also test RTL-SDR compatibility with other common software on our own Windows 10 system. We tested SDR#, SDR-Radio, CubicSDR and Unitrunker and found them all to work fine with no problems either. Finally, we also tested the Airpsy and SDRPlay on Windows 10 and found no problems with those devices either. I am frustrated with windows 10!!! Tried everything above and from other pages when trying to install a NOOELEC stl sdr dongle. SDRSharp displays a message ˜device not found” when I hit the play button. After installing the zadig driver with administrator permitions, I go check the driver details and it shows Microsoft Driver. It does not show zadig software manufacturer name. @Richard. Zadig is a great program that works flawlessly for most people. Zadig didn’t kill your mouse–you did. These articles usually include a warning to make sure you are selecting the correct usb device. If you select the wrong device with zadig, it will wipe out the old driver. I also lost my wireless mouse, and had to do a Win10 restore, a longer process than you’d think – 4 hours for that and another 10 while the indexed search facility is re-built! I’m going to try it again, and this time I’ll look more carefully for the right driver for my RTL-SDR/USB in the Zadig list. Wish me luck…. I used the Zadig software and it ruined my favorite wireless mouse. It would not function any longer in any PC. This software is junk. Don’t use it until they come up with better drivers or a better driver installer. Any USB attached device can be fried by it. Problem Solved-1 compatible devices have been found but are all busy-I had same problem , then restart win10 and I use new high quality USB cable. My device have been recognise and work like charm. Win10 home worked well with SDR# and RTL2832..Window Pro and associated updated drivers have caused many problems. I’m having a bit of a problem. I can’t get Win 10 Pro – 64 to recognize my device. The device is a Terratec LD TStick+. 2. Anyone know why it would setup 2 devices? same message as before – unable to install…. You need to restart win 10 before using zigzag. Before plugging in your USB device. On the Start menu choose Settings and in the window that opens choose Connected devices. When you plug in your USB device you should see the RTL28328U device appear. Then do a restart. Has any one solved that? Please commend with many thanks. But it ‘d be nice to know if all functionnalties of the web app “DXHeat” (that also user SDR, https://dxheat.com/dxc/) works also under W10, specially when clicking on a call sign : do the 3 icones (headset, stat and qrz) work correctly (because it is not the case on some mobiles).